Welcome to week two of Vintage SciFi Month! Last week we had a fantastic discussion about what makes older books feel dated, or not feel dated. Topic for Jan 13 – Jan 19: Gateway Drug to Vintage. Your friend says they don’t want to read anything older. They think older books are awful/dated/slow paced/badly written/etc. What titles(s) do you recommend to them to help them step outside their comfort zone? How do you convince them to give the book(s) a chance? Kaedrin tackles Robert Heinlein’s Podkayne of Mars and explains the most confusing Heinlein conversation I have ever been part of. Hello and welcome to this week’s #VintageSciFi discussion! Topic for Jan 6 – Jan 12: I just dated myself. 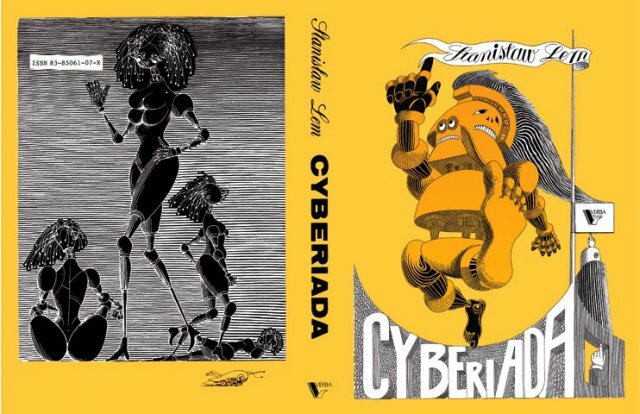 In your experience, which vintage SF books don’t feel dated? What titles have passed the test of time, and feel like they could have been written in the last ten years? Is such a book possible? What, in your opinion, makes something feel dated? Anytime this week, post a blog post with your thoughts, and leave the link down in the comments so others can more easily find your post. Not sure where to start? Here are my questions and thoughts. What makes a Vintage book feel dated? On the hard scifi side of things, whenever I read an older science fiction story and the author talks about “computers the size of a room”, or punchcards, I laugh my head off. 1960 called, they want their room sized computer back! I do want my scifi to have technology – computers, spaceships, flying cars, but almost the less the author speaks to the specifics of the inner workings of the technology (how exactly the spaceship flies, how big/small the computer is), the less dated it feels. 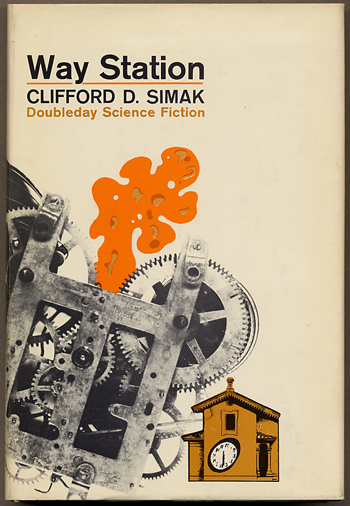 Vintage Science fiction is more a victim of the “dated through technology” issue than vintage fantasy. In fantasy, a magic wand is a magic wand, you know? 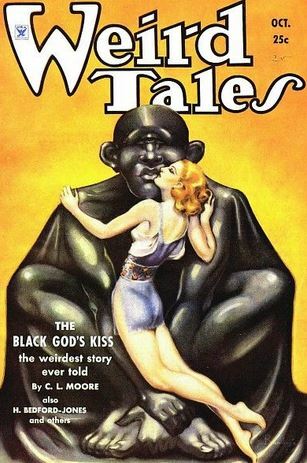 Many readers are turned off and bothered by the fact that older scifi fantasy books tend to feature only white, male protagonists, and that female and non-white characters are built around stereotypes and flimsy characterization. This can make a book feel not only horribly dated, but also offensive. In my personal experience, I’ve read some books where this is super-bothersome for me, and other times i am not as bothered. Could be the author, could be the mood i’m in that day, I have no idea. What dated books do I enjoy, even though they feel dated? 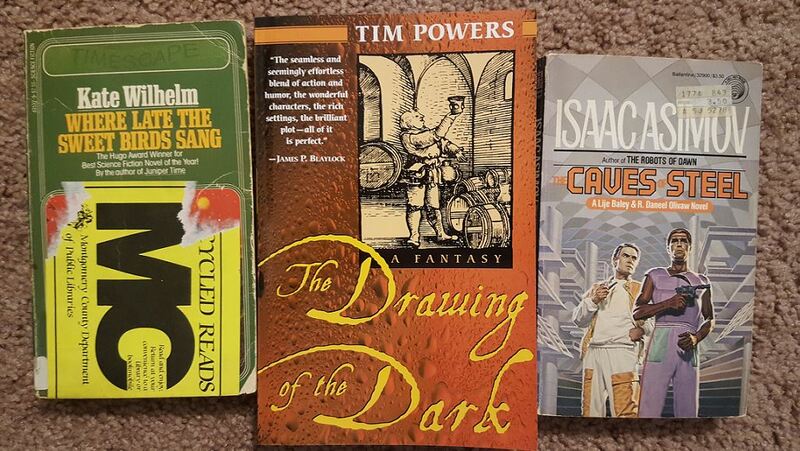 I recently read Isaac Asimov’s Caves of Steel (review coming soon!). It is horribly dated, often to the point of being funny. The main character comes off as a country bumpkin at times, and i’m hoping that was on purpose, actually, and his wife is written as a 1 dimensional cartoon character. More of this in the review, but his entire worldview is just so narrow as to be silly. So, yes, horribly dated, but more in the review about why I think this is an important read, and how influential the ideas presented were. One of my favorite older short story collections is The Best of Hal Clement, but yeah, in style and pacing, these stories feel really dated. Lots of hard scifi, good conversations, excellent commentary on communication between humans and aliens. If you’ve never read any Hal Clement, this paperback is worth hunting for. It should surprise no one that Mary Shelley Frankenstein does feel dated, and in my opinion this is 100% due to the writing style, which was perfectly modern when the book came out two hundred years ago (Yes, TWO HUNDRED years ago!!). If you’re not sure where to start with historical Science Fiction, Frankenstein a perfect place to start. What Vintage SciFi Books have you read that didn’t feel dated? I’m really interested to hear what everyone else has to say on this one, because the only ones that quickly come to mind for me are Dune by Frank Herbert, Nova by Samuel Delany, Where Late the Sweet Birds Sang by Kate Wilhelm, and Waystation by Clifford Simak. With the Wilhelm title, the first chapter or two feel a little dated, but everything after that could have been written last year. What do Dune and Nova have in common? They take place in the far future, and the lives and goals of the characters have nothing to do with today’s life on Earth. In Nova, Earth and Earth based politics are mentioned, but Lorq’s decisions are not based on 20th century Earth. Now it’s your turn to join the discussion! Happy New Year! Happy #VintageSciFiMonth! My goodness, where did 2018 go? I don’t know about you, but i’m ready to rock and roll this new year! January is sure to be a busy month for everyone (oh, hi Kickstarter! ), so let’s start #VintageSciFiMonth by removing some of that Gotta Read!Gotta Review! pressure. If you’re planning to read and write reviews, that’s great! But #VintageScFiMonth should be about more than just posting book reviews. 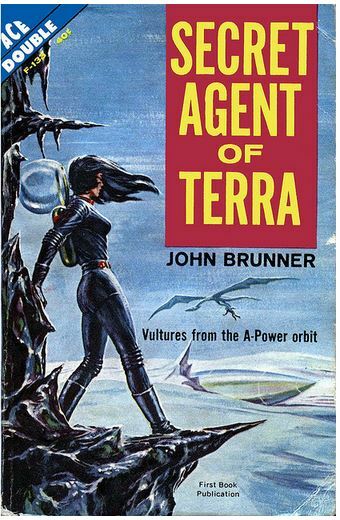 It should be about discussing older science fiction. Why are we interested in reading it? Is it worth our time? Isn’t that cover art hilarious? 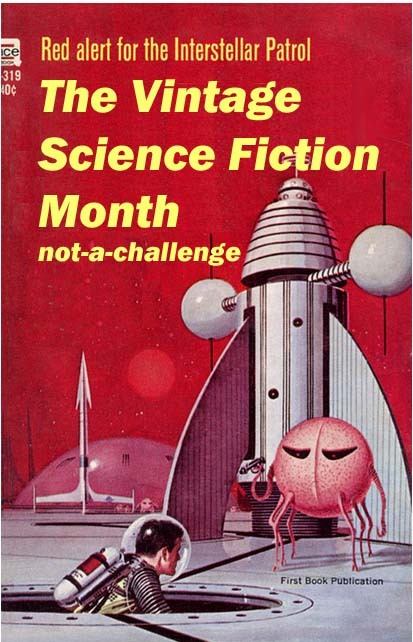 Since Vintage Science Fiction Month is a not-a-challenge, these will be not-blog-hops. They are just different discussions for each week of January, so we can all be talking about the same things at the same time. Talk about it on your blog, in other people’s comments sections, on twitter, on insta, on FB, via text message with your friends. Send a postcard. You get the idea. Here are the topic ideas and time frames, so you can put your thinking cap on ahead of time! Topic for Jan 13 – Jan 19: Gateway Drug to Vintage. Your friend says they don’t want to read anything older. They think older books are awful. What titles(s) do you recommend to them to help them step outside their comfort zone? How do you convince them to give the book(s) a chance? Want one more activity? Got ya covered. 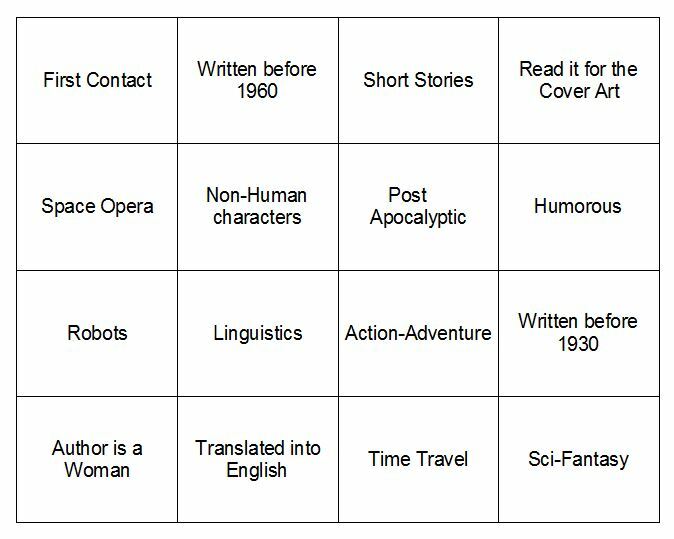 Here’s a Vintage Sci Fi Month Bingo Card. Well, more of a connect four card than bingo. . .